The Desktop Construction Master Pro Trig provides construction professionals with complete trig functions to help them quickly and easily solve complex construction-math problems. It saves time, reduces costs and prevents re-work. You can effortlessly work in and convert between feet-inch-fractions and metric units. Instantly calculate complex construction challenges for stair layouts, roofs, framing and much more. Full trig functions with sine, cosine, tangent, arcsine, arccosine and arctangent. The Construction Master Pro Trig - Desktop is perfect for completing layouts, bid and estimates. No office should be without it. It will save you time and money. Builders, contractors, carpenters and construction professionals use this advanced, easy-to-use Feet-Inch-Fraction, Metric and Full Trigonometric calculator to provide rapid solutions to complex construction-math problems. Work in and convert between all building dimensional formats, including square and cubic! Built-in functions include Custom and Jack Rafter keys with instant cutting angles, Rake-Wall key, complete Circular solutions, full Stair calculations, D:M:S to Decimal Degree conversions, automatic Block and Footing, three Memories, and a Preference Function for user-defined options. 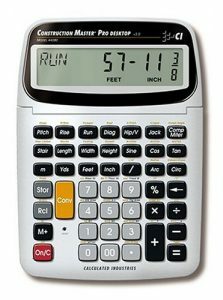 The Construction Master Pro desktop calculator (model 44080) from Calculated Industries is perfect for completing layouts, bids, and estimates as well as helping to save time and money by helping you figure out the right amount of needed materials. It's ideal for or contractors, architects, builders, engineers, project managers, estimators, draftspersons, and more. You'll be able to work in and convert between all building dimensional formats including yards, feet-inch-fractions and metric, area and volume, and it also comes with a full trigonometric functionality (sine, cosine, tangent, arcsine, arccosine and arctangent simplify complex design and construction-math). The desktop construction math calculator includes a number of built-in time-saving functions, including calculations for risers, treads, stringer length, and incline angle; how many 4x8, 4x9 or 4x12 sheets are needed to cover an area; jack rafter results for regular and irregular pitch roof; determining number of on-center studs for an entered length; and right angles. It also offers advanced solutions for circles, arches, columns, cones, pillars, windows and post-holes arcs, circumference, and segments. Additional features include a large multi-position tilt display LCD, ability to custom define your preferences (such as fractional settings), a "paperless" tape that lets you review the previous 20 entries to double-check your totals, and accumulating memory with three additional memory storage locations. I have the construction master pro trig that I carry around. Adding the desktop model to my office was a good move. Same great functions, and easy to read. Thought I would like it powered by electricity but, enjoy being able to move the calculator around. We bought one of these in July and one in August. I like the layout and functionality. However, on one of them, the "Feet" key does not always work and on the other one, the "8" key sticks at times. I wish they worked better because I like everything else. I've used the Master Pro desktop construction math calculator for the last decade - only changing the batteries as needed. This desktop version is a must for anyone in the construction industry. Beats an adding machine any day. CI has the BEST desktop construction math calculators. You can never go wrong with their calculators.I got this for desktop use and the pocket size for the field. I love my large desktop version of the Construction Master Pro. Keystrokes are easier to read and easier to share with my Students / Seminar attendees. I call it my “over 50” version. This is one of my biggest moneymakers on the job - I compare it to my pneumatic framing gun in terms of increasing speed and efficiency in carpentry. We already owned one of these calculators for many years and it stopped working so we purchased this one as a replacement. My husband uses it for construction estimating and likes it very much. I just bought this to replace my 10yr old CMP 4065. (Some buttons are getting worn out & I have to press really hard) this thing is massive compared to the 4065 and even my Casio financial calculator. All the same feature as the smaller version ...which I LOVE. Just not sure I love losing this much desk space. Great construction calculator, can't do my job without it! Best one for the construction industry! Thanks. 5* – It is a good product/item, recommendable product to friends and family members. I would like to buy it for gifting others. 4* – I like it, but there are some issues with the item. Might be I need to understand the product/item, some functions might not be functioning as described. 3* - It is okay product/item, more than one issue, quality issues, need more time to understand/test the product, Item I got might have it is own issues. 1* – Product/item has many issues, quality is a big issue, There might be many other products in the market better than this. Not recommended to spend money on it. this is my second construction Master pro-desktop the keys on this one are not as sensitive as the first one causing me press harder on the key pads. but over all this is a good product. if not for this one issue I would rate this product as excellent. I have used Calculated Industries products for 15 plus years now and I wouldn't want to work without them. Very easy to use and accurate!